The Vatican has become the latest country to recognize the state of Palestine, after a new treaty was finalized on Wednesday. Unsurprisingly Israel has hit out at the move, saying that it damages prospects for peace in the region. Abbas is traveling to the Vatican to attend the canonization of four new saints by the Pope, two of which are Palestinian nuns. The move to grant them sainthood has been described as a "sign of hope" for the region by the Latin patriarch of Jerusalem, Fouad Twal, Vatican Insider reports. The Vatican has been unofficially referring to the state of Palestine for over a year.Pope Francis visited Israel last year and the Vatican’s official program referred to Abbas as the president of the state of Palestine. During his visit to the Holy Land, he called for peace from both sides. A spokesman for the Vatican, the Reverend Federico Lombardi confirmed the news saying: "Yes, it's a recognition that the state exists," AP reports. The decision has brought condemnation from Israel, with the country’s foreign ministry saying it was “disappointed” at the move. "This move does not promote the peace process and distances the Palestinian leadership from returning to direct and bilateral negotiations," the ministry said in a text message, AP reported. "Israel will study the agreement and will consider its steps accordingly." Vatican Foreign Minister Monsignor Antoine Camilleri said the move was not politically motivated, but was simply in line with the Holy See’s position. In 2012, the Vatican welcomed a decision by the UN General Assembly to recognize Palestine as a non-member observer state. However, the latest treaty is the first legal document between the Vatican and the state of Palestine, which can be considered as official diplomatic recognition. 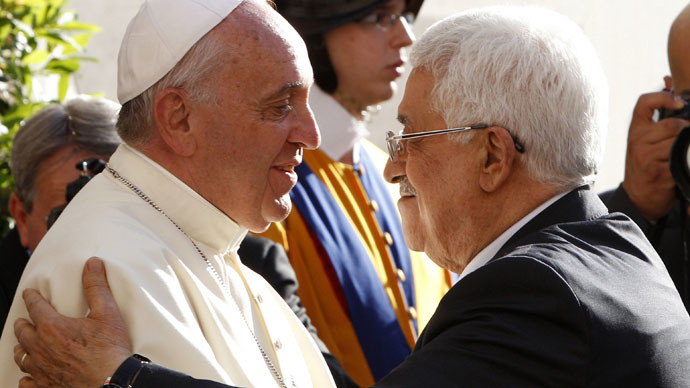 The treaty in question concerns the activity of the Catholic Church in Palestine. In April 2014, a Catholic Monastery was vandalized not far from Jerusalem in a hate crime carried out by Israelis. Slogans condemning peace talks with Palestine as well as graffiti disparaging Jesus and Mary was daubed on the walls. “Concealing or denying evil is like allowing a wound to keep bleeding without bandaging it,” said the pontiff.